Malmstrom Air Force Base, one of NorthWestern Energy’s main federal electricity customers, proposed the creation of a new tariff that would allow the base to utilize hydropower originating from the Western Area Power Administration’s Pick-Sloan Missouri Basin Program, according to a Feb. 12 filing with the Montana Public Service Commission. The hydropower, which comes from resources owned by the federal government, would enable NorthWestern to avoid replacing up to 5 out of about 220 megawatts of long-term contracts expiring between 2020 and 2026. Drawing on NorthWestern’s 2015 resource procurement plan, Malmstrom said the utility has projected a peak demand deficit of over 338 megawatts in 2016, and forecasts the deficit to grow to 688 megawatts over its 20-year planning period. Malmstrom said the allocation would lower Northwestern’s capacity needs and hence, reduce its peak demand deficit, as well as the amount of capacity it has to purchase, thereby lowering purchased power costs for other customers. The air force base would pay NorthWestern for 100 percent of the costs for purchase and delivery of the hydropower, and receive a credit from the utility at its avoided cost rates for hydropower facilities. Malmstrom, which has been working with NorthWestern over the past few years regarding the possible receipt of a hydropower allocation, filed the proposal under the utility’s rate case proceeding, saying that that a rate increase would affect its ability to operate many of its loads to the fullest extent. NorthWestern has integrated about 240 megawatts of wind and roughly 40 megawatts of small-scale hydro that yield enough renewable energy credits annually to meet the state’s 15 percent requirement through 2026, despite stringent requirements to qualify as eligible resources. 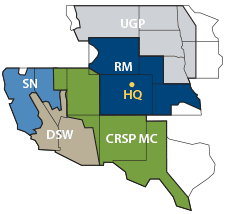 The Western Area Power Administration is one of four power marketing administrations within the U.S. Energy Department, which transmits wholesale electricity at cost from multi-use water projects. NorthWestern Energy is a subsidiary of NorthWestern Corporation.